Wooden monograms have been the latest trend for the last 1,000 years or so. 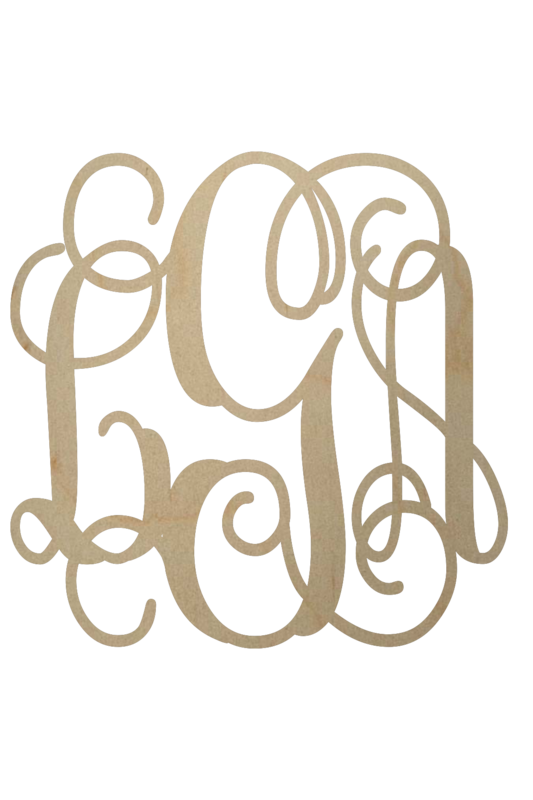 This monogram design has been around for hundreds of years and it is still in style! Wooden monograms are the latest trend for decorating your home. This script monogram has been featured in many magazines and blogs and with good reason. This style was replicated from a monogram book dating to the 1800’s! We have sold thousands of this style of wooden monogram and it still is one of our most popular style. The small wooden monograms in 1/8″ thick are perfect for adding a personalized flair for a present or wreath. The large wooden monograms in 1/2″ or thicker are ideal for hanging above the mantle for a statement piece. If you are wanting to cover the center of a wreath, we recommend measuring the wreath. Then add a couple of inches so it will have something to mount to. These wood monograms are a unique way to add a personal touch to your wedding as well.